The South Hams have a lot to offer dogs and their owners when it comes holidaying in Devon. With stunning rugged coastline, wooded walks and plenty of pet-friendly eateries you won’t run out of things to do, not to mention the many fantastic dog-friendly cottages on offer. There are so many to choose from its hard to know where to begin, so here a few of our favourites. The South Hams are large and full of natural spaces to explore. It has a long and rugged coastline with beautiful beaches, many of which allow dogs. These are some of the South Hams dog friendly beaches: Aymer Cove, Beesands, Blackpool Sands, Gara Rock Beach, North Sands and Thurlestone Sands. It is not all beaches there are also many countryside walks you can do with your four-legged friend. Aveton Gifford is a particularly beautiful pet friendly walk. It covers almost 6 miles of green lanes and pathways whilst providing views of the surrounding hills, streams and pastures. Aside from its natural beauty the South Hams is an area steeped in its local history and there are several pet friendly sites you can see here. The medieval town of Totnes is a historical market town dating back as early as 900AD. You can explore the narrow medieval walkways, old charming buildings and even shop at an Elizabethan market. Berry Pomeroy Castle is a 16th century romantic ruin where you can soak up some history with your mutt. The Pomeroy family abandoned the castle mid-way through building. Today you can enjoy the architecture and grounds while listening to the local ghost stories on the audioguides. 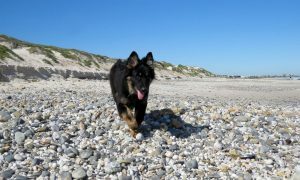 You and your dog will undoubtedly be ready for refreshment after a day of walks, beaches and history. Luckily The South Hams have lots of pet friendly places to eat and drink. The Rising Sun Woodland is a dog friendly pub and inn in Ashburton. This old country pub serves up all the usual pub grub (pies, roasts, fish and chips) with vegetarian, vegan and gluten-free alternatives. It has good food and cold beer but what makes this pub perfect for you and your pooch is that they allow dogs in the large beer garden and inside too (perfect for the colder times of year). The Sloop Inn is another pet friendly pub, this time in Kingsbridge. This 14th century pub serves up fancy pub grub offering a gastronomic twist on all the traditional dishes. They offer visitors delicious food with beautiful surrounding scenery. Dogs are allowed in all areas of the inn.